Danigral - 2 out of 5. This guy has some potential for some tricky plays, but there are just way too many good characters in Syndicate at this cost. mnBroncos - 2 out of 5. I don’t think this guy will see much play at all. Just too many better Syndicate characters. I guess I would consider him in my Syndicate/Cthulhu deck because having toughness makes him a solid Khopesh target. Obtuse - 3 out of 5. I honestly can’t wrap my head around this guy. I’m rating him squarely in the middle erring on the side of him maybe being alright. I can see some obvious tricks with him, but he’s still a syndicate character that wants to fail a skill check (lets point out that you either succeed or don’t on a skill check, there is no “winning” or “losing” technically) and that just seems terribly, horribly wrong to me. livingend - 2 out of 5. I don’t think this is unplayable per se. Then again, it’s not much more than that either. Escaped Convict’s forced response will only reliably trigger on your turn, since the attacker gets to choose the order of story resolution. That already narrows down its range of application significantly. The card is in a weird spot where you want to send it to a story alone as the attacker to gather free unopposed tokens but a single opposing terror icon just blanks it. Still, that’s probably the best use of Escaped Convict: Go all in on one story in order to force your opponent to commit heavily to that story and then grab free success tokens on outlier stories. Verdict: Not gonna see a whole lot of play. Too bad, this could’ve been a great card, it just needed willpower or one more icon. WWDrakey & Ire - 4 out of 5. We’ll admit, we likely gave this guy an extra point just for being cool. Well, the printed Toughness is a rare thing in Syndicate, so I guess that’s part of it as well. This card just seems to scream: “Shenanigans!”, especially with being able to take part in all three stories during a single turn, if the stars align. Also, fun to get a card which makes your opponent scratch their head when trying to do the obvious thing and overpower you in skill-struggles. This is supposed to be a Disrupt effect, right? I checked the errata, but I didn't see this card. I'm thinking Forced Response can't be right. It has to be a Disrupt. Never thought about it because I wasn't big on Criminals until their box arrived at my doorstep yesterday, but yes, his text doesn't seem to make sense. I mean, he can be committed to a story that wasn't resolved yet, I guess, but the resolve step is already through, so he just gets uncommitted at the next possible step. Gotta be a Disrupt, nice catch. It would be alright, if the time table was slightly altered (which individual response windows for each story), but that isn't the case, or is it? No, Forced Response works and appears correct. Remember, both disrupts and forced response can occur during story resolution, its only regular responses that are delayed to the end. See the description of green boxes from the turn sequence description near the end of the rules. Ah, thanks for the pointer, yeah, it's clearly just like you said. Thanks for the clarification. I didn't understand that rule. It's weird how this card refers to losing a skill check. As mentioned in the reviews above, you can't lose a skill check. You either succeed or you don't. I assume the practical direction of "losing" a skill check is that you have less skill than your opponent at that story (or you tie but your opponent has more Fast than you). If you tie on the skill check, I guess you haven't lost, so the ability wouldn't trigger. 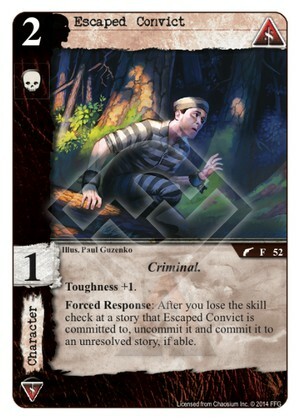 Also, I see no reason why the Convict couldn't trigger on either player's turn. I checked the errata, and that doesn't offer any help. If anyone has any personal experience or advice on how to adjudicate this ability, I'd be interested to read it.